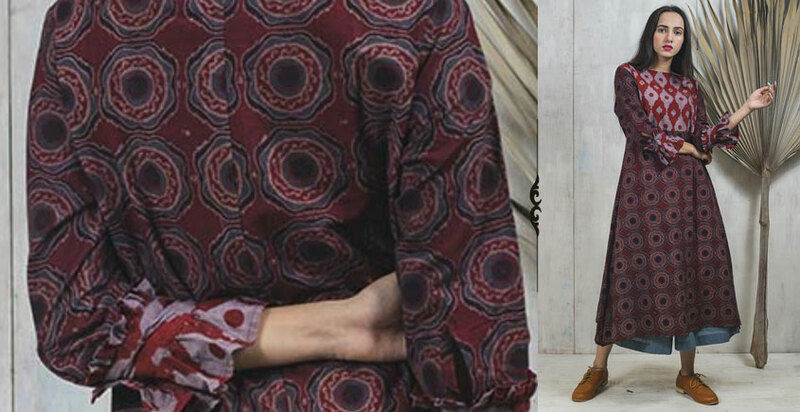 About Product : Hues of blue scattered... stirred with some red... deepened with black... & calmed with white... create amalgamations so pleasing... forming patterns with a vision... find yourself spellbound with these amazing handblock printed ensemble today! Bagru, a town at the outskirts of Jaipur(Rajasthan) is oneof the textile hubs. It is known for centuries for its natural dying, syahibegar printing, indigo dying and wooden hand block printing. Syahi begar printing is one of the traditional hand blockprint techniques where the prints are in the combination of red, black andyellow ochre or cream. Syahi (black color) is made by keeping the mixture ofhorse shoe iron, water and jaggery in an earthen pot for around 15-20 days insummers whereas; in winters, it takes around 6 weeks to get ready. Then tamarindseed powder is mixed to this mixture and boiled. Begar (red color) is made by mixing Alum (fitkari), Madder(lal mitti) and juice of baboool gond. 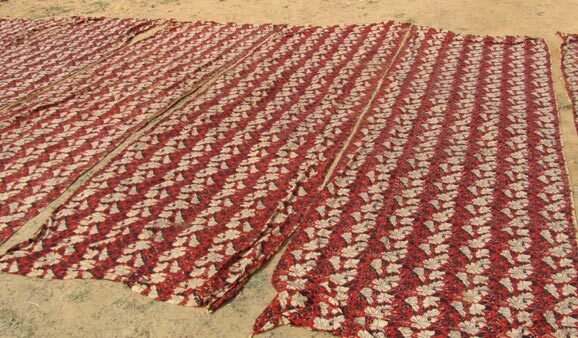 The process of Syahi Begar involves pre-washing and soakingthe fabric in fresh water and turcoil oil for 24 hours. It is done to remove allstarch, dust or any other contaminants. Next the fabric is beaten to remove leftover dust. The fabric is then dyed in the Harda (merubelum powder) solution. Itallows the natural dyes to adhere to the fabric and become colorfast. Thetypical yellow dye or color is obtained from the Harda fruit which is againyellow in color. The dyed fabric is then spread on long padded printingtables. There are three different blocks used to make the prints. 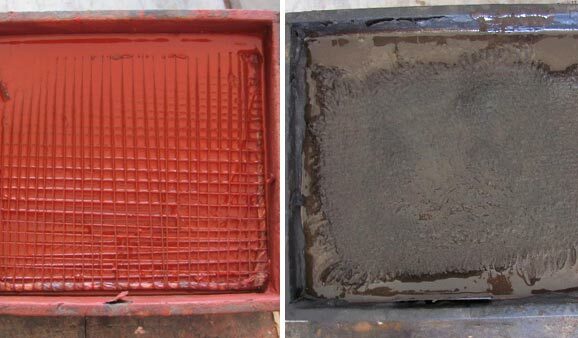 First blockthat is a Gadh block,it is used for the background, next the Rehk block for fineoutlines and finally the Datta block for inside filling. There can be more thanone Datta block to fill in different colors. This process of printing isrepeated over and over again. At last, the fabric is left to dry after completion ofprinting. Then it is washed 3-4 times in fresh water. 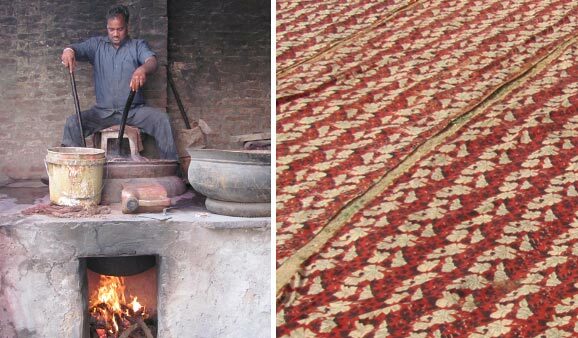 The fabric is then boiledfor around 5 hours in a large copper pot (bhatti). The pot consists of a mixof natural ingredients like alizerine( aal ki lakdi) and sakura flower (dawariaka fool). After boiling, the fabric is once again dipped in Harda to remove theexcess alum (fitkari). 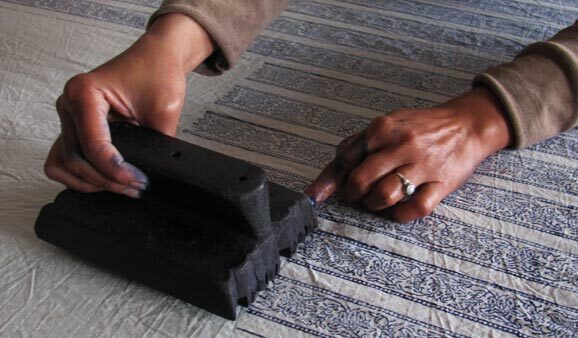 The block printed fabric is then roll-pressed and is ready. Note ♦ Delivery Time : 6-8 working days from the date of confirmed order ♦ The items in this category are non refundable but you may exchange this product with any other product from the same category. ♦ The products in this category is handmade. ♦ The product is only eligible for a refund in the case of damage or defect. 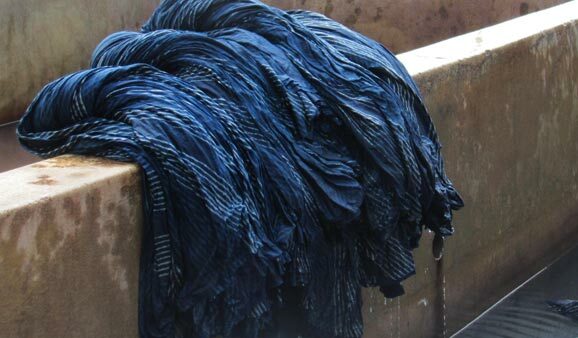 Note As the fabric is naturally dyed, though artisans pre-process and wash fabrics before the production, still care should be taken during first 3 washes, as some of the natural dye material may wash off during initial washes. The natural dyed fabrics should be hand-washed or mild machine washed separately in cold water with mild detergents. These fabrics should not be bleached or scrubbed and should be reverse dried in shade. The fabrics should be ironed on reverse to preserve its charm. 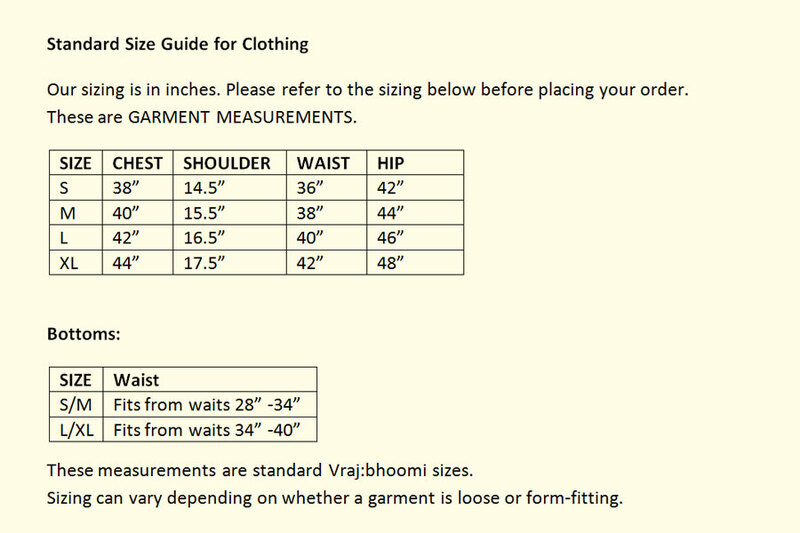 Product details Easy fit. 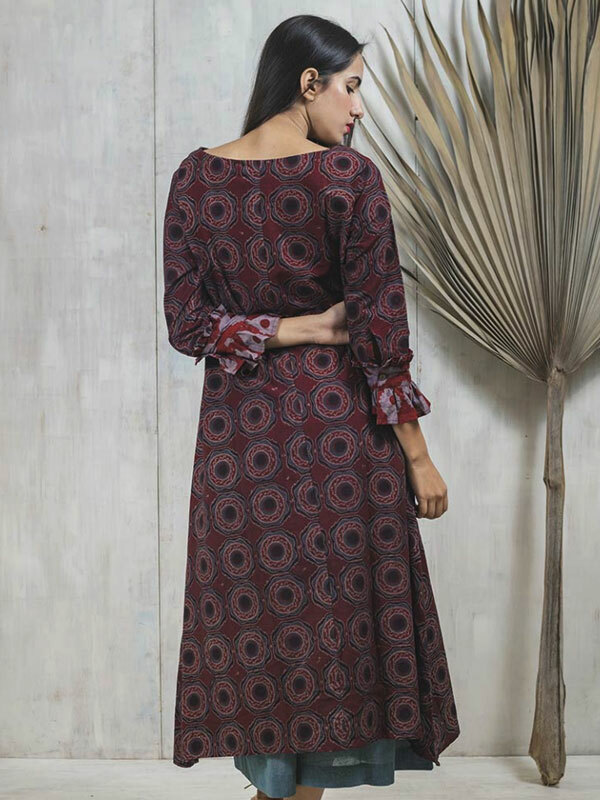 100% cotton, hand block printed with natural dyes. 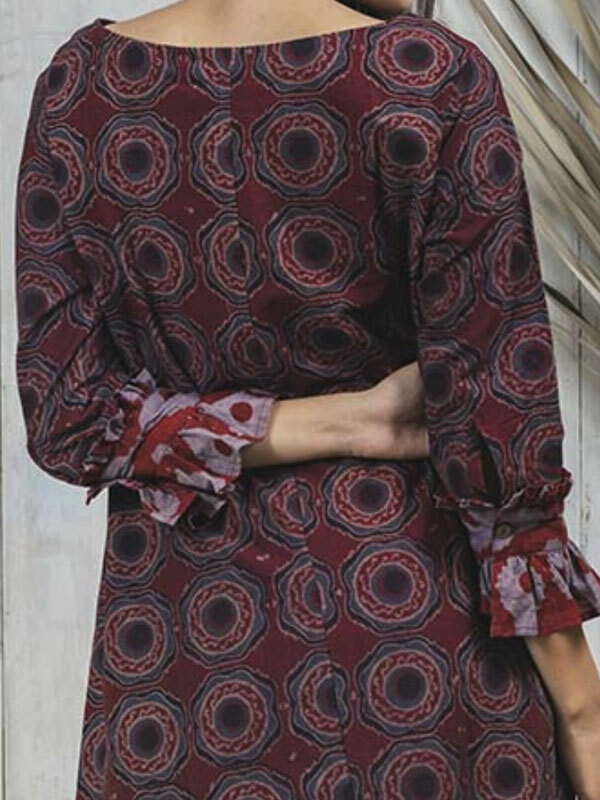 Ruffle sleeve. Full Length is 44"